Connector fits 5 mm OD blown fiber tubing. Optical Blown Fiber Connector, Model OBFC-5-1, is suited for Fiber To The Home and Fiber To The Premises blown fiber applications. Tube insertion depth is .66 in. with collets in release position. During installation, clear polycarbonate enables installer to see fiber through connector body. Nitrile O-rings provide gas- and water-tight seal. 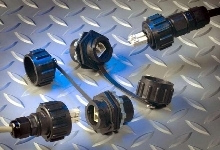 Connector System withstands harsh environments. 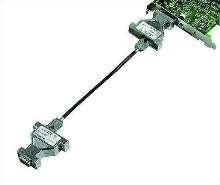 Fiber Optic Connector facilitates networking applications. SC Connectors optimize performance on 1.6-2.0 mm cable. Singlemode SC Connectors have been tested to Telcordia GR-326, Issue 3; Service Life-Part A, using standard match-cladding fiber. 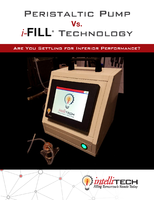 They incorporate 6-position tuning feature, which optimizes fiber alignment and performance. Connector allows noise-immune CANbus communication. Fiber Optic Connectors are field-installable. Fiber Optic Connectors suit telecom applications. 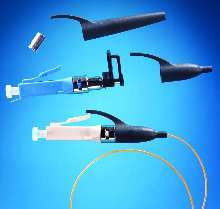 Optical Fiber Connectors suit premise wiring applications. Connector has a mechanical push-pull design latch.